There was never a chance that Turbowolf were going to become mainstream rock darlings, but to assume that was intention in the first place would be to miss the point entirely. For all the steps that rock has made to embrace rougher, more unique styles, Turbowolf’s pungent concoction of grunge, punk, garage-rock and psychedelia did a lot to alienate them from universal acceptance, but with a sound they really could call their own and a pair of excellent albums to boot, their underground credentials appeared to write themselves. But even with success consistently coming their way, The Free Life isn’t Turbowolf stepping out of the shadows with a big, clean modern rock album to capitalise on it; the closest to “mainstream” that this album gets is a guest appearance from Royal Blood vocalist Mike Kerr. Rather, The Free Life is really more of the same, pushing Turbowolf’s dank, dense noise through the same glossy yet gilded lens that has defined so much of their work. Even if it is just more of the same, The Free Life‘s left-of-centre take on hard rock remains as captivating as pretty much everything that Turbowolf have offered in the past. 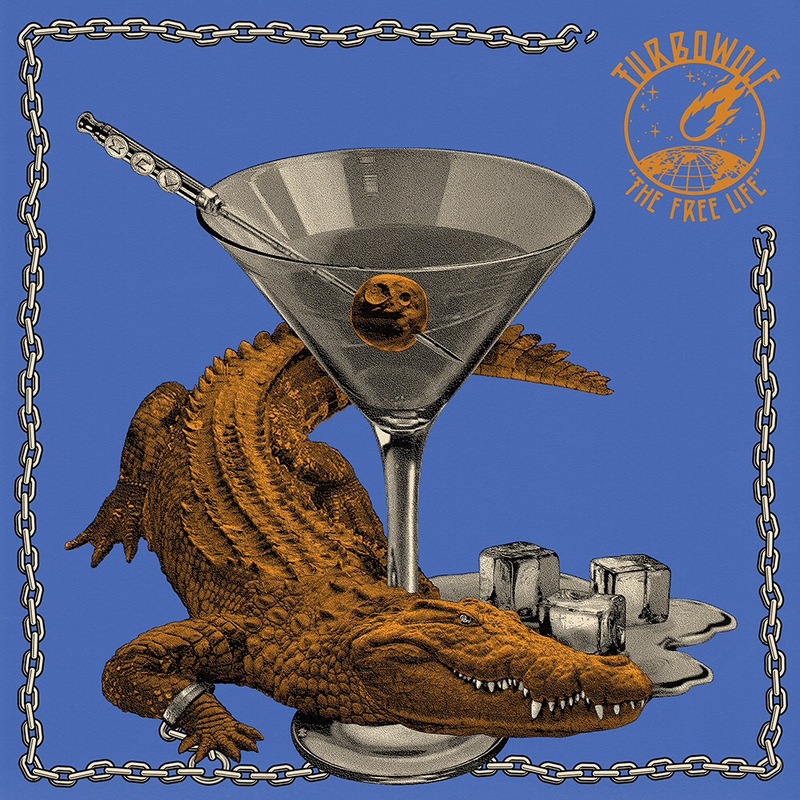 And right from the distorted squawk of guitar that dominates opener No, No, No, the additional gears that crank away to bring Turbowolf’s operations to fruition are easy to see. The foundation of hard rock and garage-rock riffage remains stable throughout, and alongside the clattering blues grooves of Domino and Last Three Clues, the woozy, wispy electronics of Halfsecret and the thunderous metallic battering of Very Bad, the compositional skills are rock-solid from start to finish, as well as yet another demonstration of the eclecticism that’s always been a big strength in this band’s arsenal. Coupled with the thick, oppressive production that crams so much meat into these songs without hitting any significant discomfort and Chris Georgiadis’ greasy creep of a voice, there’s ample proof here that this is a sound that still has significant mileage, and the lack of real progression or evolution isn’t much of a detriment at all. That’s not to say that nothing has changed, a statement that the crop of guest contributors would definitely attest to. This is the most collaborative that a Turbowolf album has ever been, though on the same token, it’s disappointing to see this series of recognisable, distinctive vocalists reduced to what are effectively cameos. That’s what’s most disappointing about The Free Life, the fact that the potential for something truly amazing is woven into its DNA, and yet chooses to stay with a tried-and-tested formula. It’s not even as if these guests get much room to work with either; Vodun’s Chantal Brown easily fares the best on Very Bad with her soulful bridge amidst the ghostly synths, but Kerr and Idles’ Joe Talbot feel increasingly hemmed back on Domino and Capital X respectively, and there’s a very real possibility that you wouldn’t be able to tell that Death From Above’s Sebastien Grainger is on Cheap Magic if it wasn’t marked out on the tracklist. And while it’s a shame that so little comes of this, to call The Free Life a disappointment would be overlooking a fairly fantastic performance from Turbowolf themselves. There’s not an outright bad song here (even is Concluder is a little too meek and undercooked as a closing note), and with the likes of Last Three Clues and Up & Atom serving as the most conscientious refinement of this sound to date, this is another work that’s not too far removed from the two great albums that preceded it. It’s not quite to the level of either, but Turbowolf aren’t exactly resting on their laurels either; for as stagnant as both hard rock and garage-rock can be, this sort of wild, weird deviation from the norm is always accepted. ‘The Free Life’ by Turbowolf is released on 9th March on SO Recordings.